ENTRIES NOW OPEN for SCASA's 2019 Gauteng Region Coffee Competitions taking place 26-28 July at Coffee & Chocolate, Ticketpro Dome, Johannesburg. Judges training will be Thursday 25 July 2019, Venue TBC. Congratulations to the new Gauteng Regional Coffee Champions! Thank you to all our sponsors and volunteers. Winner: Thabang Klainbaas Maluleka - Ciro Full Service Beverage Co. The 2018 National Champions have just been decided but as it always goes, the next cycle of Regionals is hot on their heels to begin the search for 2019 contenders. The Gauteng Regional Coffee Competitions (Cup Tasters, Barista and Latt Art) will be from 6th-8th May 2018 held at the Gallagher Convention Centre. Last year this team played host to the Nationals and it was a roaring success, we look forward to HOSTEX this year. You can sign up for your free trade ticket here. *Note for judges: The WCEP Training to qualify to judge at World Coffee Events will be happening in Durban from 24 - 28 July 2018. More details on this to follow soon, but it's a good idea to get some training in at the Regionals! Wow! Everybody who was at the Good Food & Wine Show JHB could agree that the standard was exceptionally high. Congratulations to Trevor Fitz, the new Gauteng Barista Champion!!! Well done to all competitors! Shew, Nationals 2018 is going to be epic! Photos courtesy of our Media Partners, The Coffee Magazine. Full album here. Get down to the Good Food & Wine Show at the Ticketpro Dome to support some of the most talented baristas in Gauteng! It's going to be a wonderful weekend with some stiff competition!!! Will Khulekani Mpala defend his crown? Or will a new champion emerge? 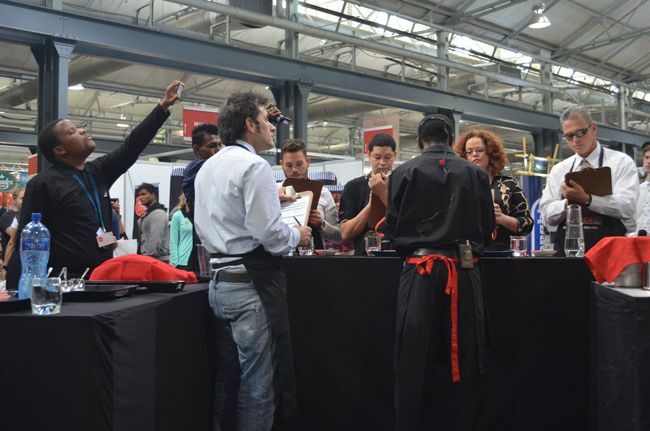 Have you entered the Gauteng Regional Barista Championships? 14 amazing baristas already have! Throw your name into the ring and you could be South Africa's next Barista Champion! The competition will be held at Good Food and Wine Show, Johannesburg, 28-30 July 2017! Khulekani Mpala will be back to defend his 2016 Gauteng title, along with TriBeCa colleagues Harry Mole and John Evans. The popular Whippet Cafe has two entries this year and Musa Magwaza, who last competed in KZN, but has since relocated to join the Starbucks SA team, will rejoin competition! A very exciting field indeed! Do you have mad latte art skills like Amadeu from the Eastern Cape? Do you want to learn from people who have competed successfully on the World Stage? Do you want the chance to compete against the current National Cup Taster's Champ, Simphiwe Adams, who just won the Eastern Cape Regionals again? Following the new schedule format the Latte Art and Cup Tasters competitions are now standing on their own two feet at a seperate venue to the Barista Champs. This Johannesburg event will be held at the Coffee&Chocolate Expo at Montecasino from 13-16 July! Exciting news is that C&C will also play host to the World Coffee Events All Star event, the first of it's kind in South Africa. It's all happening from 3-5 May at the Food & Hospitality Africa Show, Gallagher Estate. The competition will take place at the Tea & Coffee Pavilion and is set to be a fantastic event with baristas from all over Gauteng. Besides showcasing the best coffee professionals in Gauteng who will be battling each other for the titles in Latte Art, Cup Tasters and Barista competition categories, the SCASA stage will be a vital access point for visitors to learn more about Speciality Coffee in South Africa. Stop by and watch the competition or take part in one of our demos where you'll get to meet leaders in the coffee industry and talk all things coffee. So here's what the three days will look like. 4pm - 5pm SCASA AGM. 11am - 3.30pm: Barista Championships Finals - Top 6. We look forward to seeing you there! Baristas if you haven't sent in your application then download it here and send it in asap. "This competition is all about performance, skill and passion for coffee, as well as being able to pour delicious coffee under pressure, with a total of seven highly skilled judges watching the barista’s every move as they produce 4 espressos, 4 cappuccinos and 4 signature drinks, all in under 15 minutes! There are only 24 spots for baristas in the National Finals, 6 from each of the 4 competitive Regions and with so much on the line, the competition will be fierce!" Baristas will also be competing in the Cup Tasters and Latte Art competition so this is one weekend you don't want to miss out on. Come along and meet some of SA's top coffee talent. Read the full Press Release from The Coffee Mag here. Are you a barista in Gauteng? The Gauteng Barista Champs are around the corner! Competitions are a fantastic way of learning new skills and having fun, while interacting with other baristas and judges. Download your entry form HERE and enter today. SCASA will present the Gauteng Regional Coffee Competitions at the Homemakers Expo (Coca-Cola dome) between 27 Feb - 2 March 2014. Please email George Bertolis before Thursday 13 February 10am, if you are available to be part of the judging team! Once we know who is available we will let you know if you are going to be a coffee comp judge. Please note in order to be able to judge you need attend the compulsory judges calibration, tasting and training session on Wednesday (26 Feb 2014) You will also be required to attend the calibration session each morning before the start of the competition as well as the barista debriefing. 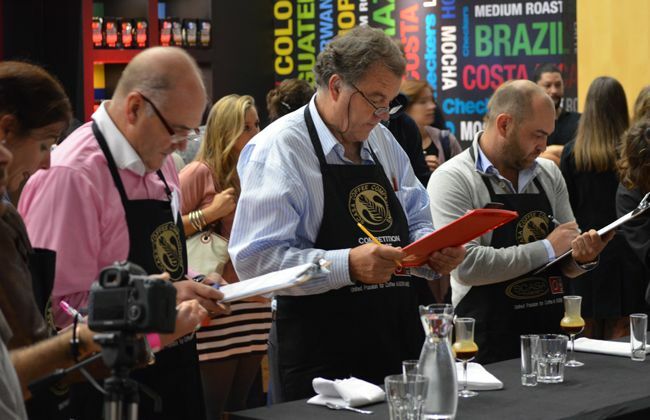 Judging in the Gauteng Regional Coffee Competitions? Also please remember to only eat bland foods and no perfumes or strong deodorants before training and during the competition! To compete in the Gauteng Regional coffee competitions, click here to download the registration form.